Trevor Rowlands represented Collingwood in the first two games of the 82 the club contested in the Machine team years. But he was destined to make a much bigger name for himself in another sport, and in another state. Cricket was Rowlands’ true passion, and he came to play a role in the development of the game in Western Australia, captaining that state on a number of occasions – twice against Don Bradman. Born William Trevor Rowlands in Echuca in 1904, this son of a Welsh Methodist minister combined his studies and his sport from his earliest years. He was granted a scholarship at University High School and played football and cricket at competitive levels. He represented University in district cricket and also developed into a talented young footballer who served as vice-captain of the University Blacks in 1926. His “neat and nippy style” saw him selected in Collingwood’s opening game of the 1927 season, against Geelong at Victoria Park. He played well enough at half-forward to be retained the following week against Hawthorn, although he was moved to half-back. He seriously injured his ribs in a collision early in that game but won many plaudits as he “played on pluckily” rather than leave the team short. The injury forced Rowlands to the sidelines for a number of weeks, and by the time he was fit again the team was charging towards a Premiership and he couldn’t force his way back. Soon afterwards he shifted to Perth after securing a teaching position. He made a brief reappearance in the Magpie fold when the club took a late-season trip to Western Australia. He attended the club’s dinner and smoke social night with the South Fremantle Football Club, sitting on the table of his former coach, Jock McHale. Rowlands became a schoolmaster at Hale, where he developed into an excellent teacher and coach. A keen English literature buff, he could quote entire passages from the works of Shakespeare at will. However, it was as “a good upper order batsman, medium pace bowler and astute captain” that Rowlands excelled, according to WA’s cricket historian, Bill Reynolds. Rowlands played seven first-class games and 153 games of grade cricket and had success as a cricket coach. 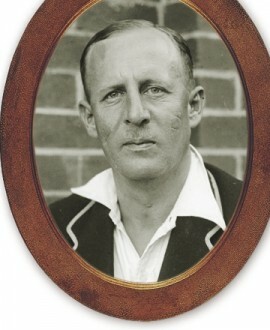 In 1938 he captained WA in a game against an Australian XI led by Don Bradman – undoubtedly a highlight of his career. He made 22 and 2 that game, and took four catches in the field, including one to get rid of Stan McCabe. Trevor Rowlands managed to rub shoulders with two of the sporting icons of the Depression era – the Machine Team and Don Bradman. In anyone’s language, that’s a handy sporting double.